What key metrics do you provide? We report these metrics along with total traffic lift and widget CTR in your readership spreadsheet,. 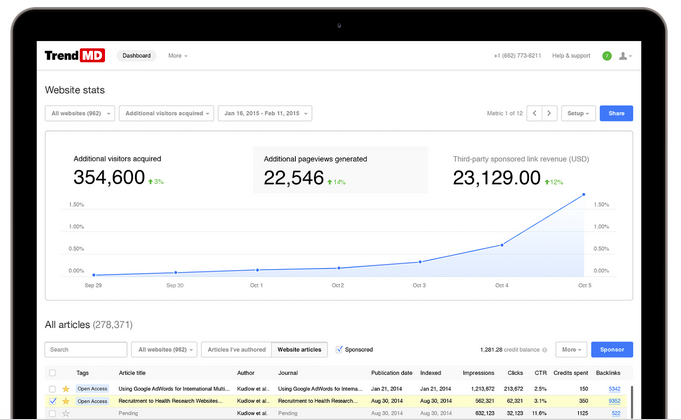 You can also track TrendMD visitors through Google Analytics. Email your Account Manager for access to your readership spreadsheet or if you use a traffic tracking system other than Google Analytics. Don't know who your Account Manager is? Email us! What is the traffic growth metric and how is it measured? TrendMD directs additional visitors to your website(s) via clicks on your internal links, which are distributed on third-party websites in the network. Your credit balance decreases by 1 credit when a click occurs on a link to your content featured on a third-party site. Traffic growth is calculated by dividing the additional visitors directed to a website through the TrendMD widget by the baseline traffic on that site. What can I do to increase my CTRs? These are some factors that affect CTRs and steps you can take to increase your CTRs. Time Since Install Part of what makes TrendMD different is we make use of analgorithm to generate our recommendations. Because the algorithm learns about your content over time, the recommendations to your content will improve drastically over the first few months the widget is installed. This is an example of how TrendMD recommendations improve over time. Widget Placement We often see low widget CTRs when the widget is less visible on the page (at the bottom of open access articles, or hidden in a tab). The best CTRs are seen when the widget is highly visible, we encourage you to play around with the widget placement and see what works best for you. See here for more recommendations. Broad/Narrow Content When your content is directly related to too large or too small a group of articles in the TrendMD network, it can take longer for the algorithm to determine optimal recommendation locations. If you think this might be preventing you from reaching your goals, speak to your Account Manager. Can I track where TrendMD visitors are coming from? Click on “sponsored” button in the window. 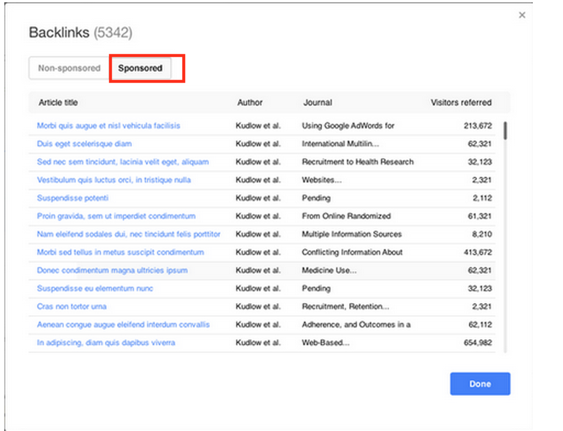 This window contains a list of the articles where your sponsored links have appeared. 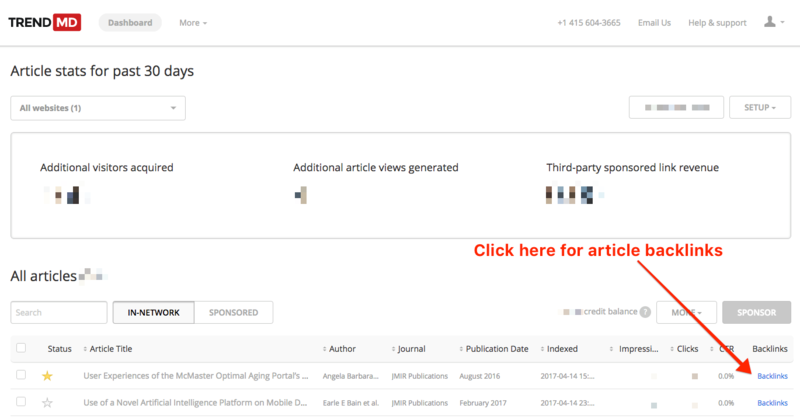 Links to your article will change overtime; even though links to your article may have been seen in the widget results of another article at one point in time, it might not appear in the widget when you visit that page. See here for details on how we generate recommendations.